All Denver Metro Areas, but I can travel throughout Colorado with proper notice and arrangements. I work on a reward basis, what it is worth to you and what you can afford for me to come out and find your lost item. Additional expenses may incur for my travel time and fuel expenses to travel out of the metro area. For lost treasure and caches will work on percentage basis. Everything is negotiable. Yards, Parks, Old farm lands, Ski Slopes, Lakes, Beaches, in snow and water. Lost Treasure, Cache Hunting, Crime Scene, Archeological, etc. 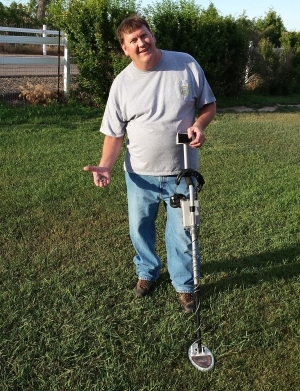 In high school my dad purchased a Bounty Hunter metal detector to look for property markers, that started me down the path of treasure hunting. I've been metal detecting for several years and have always enjoyed the thrill of the hunt. It is very rewarding to help someone find their lost sentimental or irreplaceable item that they believed to be gone forever. I'm a member of the Eureka Treasure Hunters Club for metal detector enthusiast, the World Wide Association of Treasurer Seekers (WWATS) for treasure hunting, and the Gold Prospectors Association of America (GPAA) to search for gold! I'm looking forward to help you find your lost item.